Take a tour of the homes that lie at the heart of our eternal existence and get excited about the part women play in creating Heaven on earth. The scriptures are full of examples of different kinds of homes. The word “fold,” which describes a home for sheep, is a symbol that represents the Church. “Household” is another term that describes the Church. Temples are designated as houses of God. The word “refuge” is also used to describe the temple, as well as different cities, the New Jerusalem in particular. The Lord refers to Zion as his “abode forever.” The terms “habitation” and “dwelling place” describe the temple, Zion, and Heaven. The word “mansions,” always plural, never refers to any type of residence but the one of God. To get a feel for the integral place of homes in God’s plan and the indispensable role women have in creating them, let’s take a tour of the homes that lie at the heart of our eternal existence, reflect on their multifaceted beauty, and observe what is required to “make” those homes. From Latter-day revelation, we learn that our first home was with our Heavenly Father in his celestial mansions. We often long for a description of our premortal home and the life we led there, and it’s easy to become frustrated by the scarcity of information. For that reason, statements such as the two that follow are treasures. I want to tell you, each and every one of you, that you are well acquainted with God our Heavenly Father, or the great Elohim. You are all well acquainted with him, for there is not a soul of you but what has lived in his house and dwelt with him year after year; and yet you are seeking to become acquainted with him, when the fact is, you have merely forgotten what you did know. There is not a person here today but what is a son or a daughter of that Being. In the spirit world their spirits were first begotten and brought forth, and they lived there with their parents for ages before they came here. Remember, in the world before we came here, faithful women were given certain assignments while faithful men were foreordained to certain priesthood tasks. While we do not now remember the particulars, this does not alter the glorious reality of what we once agreed to. . . .
How special it is for Latter-day Saint women to be given the lofty assignments they have been given by our Father in Heaven, especially those of you who have been privileged to be born in this part of this last dispensation. We know little about the premortal life we led in the home of our heavenly parents and even less about the nature of our role there. Would it not, however, be logical to theorize that we engaged in our primeval apprenticeship by working, relaxing, and rejoicing alongside our heavenly parents in the same way we do our earthly parents? Perhaps we can best be true to our premortal role as women by honoring our mothers and fathers, learning all we can from them about our divine roots and destiny, and doing everything in our power to be exemplary daughters. Eventually the time came to leave the celestial home of our heavenly parents and be born as mortals on our new home, the earth. The many creation accounts we possess not only vividly describe the earth and the many orders of life therein and thereon, but are detailed home creation blueprints. Let’s isolate each day of the creation account contained in the Book of Moses and compare the procedures the Lord used to create our earthly home to the procedures we as women use to create our own homes. When confronted with the task of organizing the enormous amount of matter that must have been used to create the earth, the Lord took the most powerful tool he had, the priesthood, and little by little, began sorting through the matter and putting it in its proper place. And I, God, said: Let there be light; and there was light. And I, God, saw the light; and that light was good. And I, God, divided the light from the darkness. According to this account, God’s first step in creating the earth was to divide the light from the darkness. In our lives and in our homes, we too must divide the light from the darkness. We must perfect our ability to recognize the good and bad in everything around us and then use that knowledge to gather in the good things and discard those things that are evil. In our own homes, we can compare the light to the Holy Ghost; our homes glow with spiritual power as we conduct family home evenings, read the scriptures, play uplifting music, and speak with kindness. During the second phase of creation, the Lord began forming the planet, the actual physical place where physical life could live. A home always begins with a place, whether that place is as small as the corner of a room or as large as a planet. And I, God, said: Let the waters under the heaven be gathered together unto one place, and it was so; and I, God, said: Let there be dry land; and it was so. . . .
Once God completed his construction of the planet itself, he gradually organized the different systems on it, making it more functional and beautiful. We follow his example in our own homes when we clean, plant gardens, organize our possessions, and create and display artwork. Just as God organized the times and seasons of the earth, we organize the times and seasons of our lives when we set priorities, establish a routine for work and righteous living, and progress toward goals that make all of the seasons of our lives meaningful and full of joy. And I, God, created great whales, and every living creature that moveth, which the waters brought forth abundantly, after their kind, and every winged fowl after his kind; . . .
Once the earth was formed and beautified and its systems organized, it was prepared to receive animal life. Obviously the Lord feels the fishes and fowls need a complete home, one with an atmosphere of light, order, and beauty. How much more, then, do we, as his offspring, need a home with those same qualities! And I, God, blessed them, and said unto them: Be fruitful, and multiply, and replenish the earth, and subdue it, and have dominion over . . . every living thing that moveth upon the earth. The Lord waited until the creation of the earth was complete before he placed Adam and Eve into the Garden of Eden because he knew they needed more than just a place that would provide shelter—they needed order, beauty, an atmosphere of light, law, companionship with other forms of life and with each other. And on the seventh day I, God, ended my work, and all things which I had made; and I rested on the seventh day from all my work. When life is hectic and we think that creating and maintaining a home is the most thankless, dreary job on earth, we should reflect on the fact that we are doing the same thing for our families that the Lord did for us all of those millennia ago, only on a smaller scale. We should also remember that even the Lord took time for himself and rested—what an example of stress management! Our Heavenly Father knew we needed the earth to progress, and its creation was an act of love. 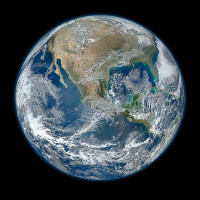 We, in turn, best magnify our role as stewards of the earth by recognizing the Lord as the Creator and worshipping him. We can also take care of the earth, learn about its systems, and extend loving service to our brothers and sisters who share it with us. For the complete program, please see Home, The Heart of Eternity.